Licensed Slots from blockbuster movies are incredibly popular at online casinos, and as such, designers like Playtech put a lot of effort into making them the best they can possibly be. The Kong slot is absolutely no exception. It features stunning graphics, excellent gameplay and a plethora of varied bonus stages spread across two base game modes. Dinosaurs and giant apes running amok through an urban metropolis… What’s not to like? Visually impressive. 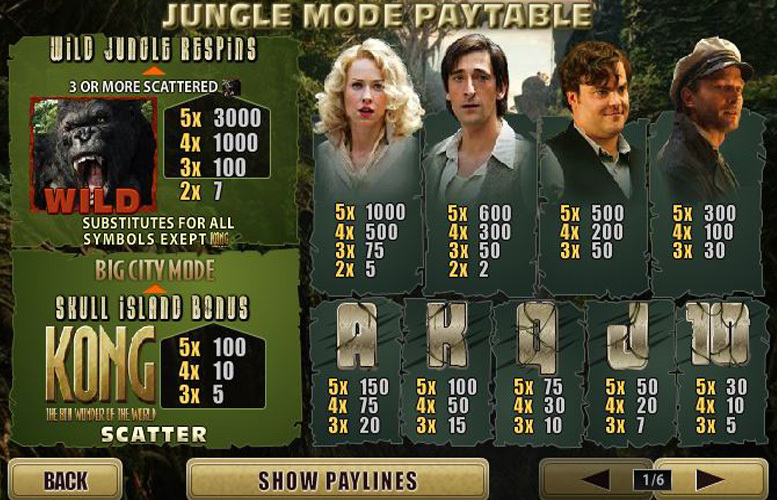 Playtech have worked hard to ensure that their slot matches the mood of Peter Jackson’s 2005 movie. Through extensive use of cutscenes directly from the movie, they easily achieve their goal and more. Game remembers where you were playing last. Re-entry will take you back to either the jungle or the city. Fantastic gameplay. Kong features two game modes, and different bonuses for each. The full experience will be data intensive if using a mobile device. King Kong wild symbol = 3,000x the line bet. Fay Wray = 1,000x the line bet. Adrian Brody = 600x the line bet. Jack Black= 500x the line bet. Thomas Kretschmann = 300x the line bet. The game starts in Jungle Mode. 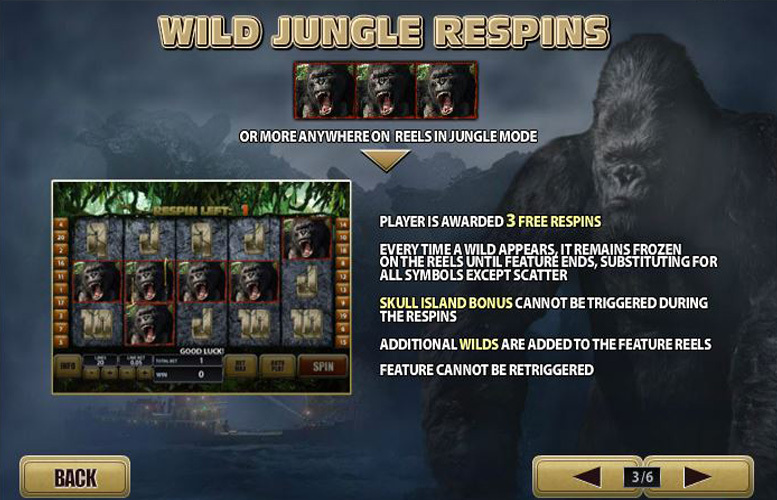 The background, and symbols are appropriately styled, and the two specials features on offer are the Wild Jungle Respins Feature, and the Skull Island bonus. Landing three or more of the Kong wild symbols anywhere on the reels triggers the Wild Jungle Respins feature. The player receives three free re-spins. Every time one of the extra added wilds appears, it remains frozen on the reels until feature ends. 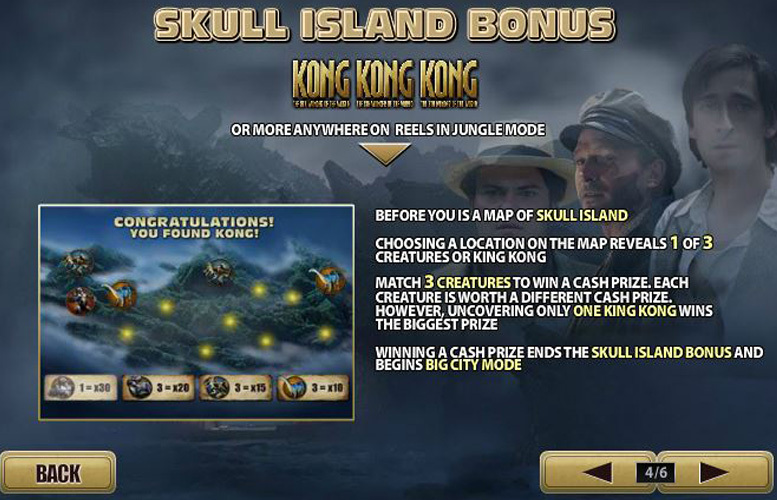 Note: The Skull Island bonus cannot be triggered during the re-spins. Landing three or more Kong game logos anywhere on the reels triggers the Skull Island bonus. Players are presented with a map of skull island. They must then choose a location to reveal one of three creatures, or King Kong. Matching three of any creatures will win a cash prize. Uncovering the only King Kong will win a massive pay out. The game’s second base game, Big City Mode, begins when exiting the Skull Island bonus. When players leave Skull Island, they enter the Big City. The background changes, as do the symbols. The pay table remains the same, however. Two different special features replace the bonus modes previously described. Landing three or more Kong wilds anywhere triggers the Wild Kong Respins feature. The player is awarded three free re-spins. On the first, all symbols on reels one and five are wild and substitute for all symbols except scatter. During the second re-spin, all symbols on reels two and four are wild. The third re-spin makes all symbols on reels one, three, and five wilds. Landing three or more Kong anywhere triggers the City Tower Bonus. We’re taken to the city tower, where King Kong is under attack in the iconic scene from the movie. You face three planes coming in three waves. Each wave you must pick a plane to take down. Each plane has a cash prize attached. After you’ve had your three attempts, you return to Jungle Mode. One of the coolest things about the game modes in the Kong slot is that the game remembers which mode you were playing when you exit. You actually re-enter in the mode you were playing before exiting. Ace = 150x the line bet. K = 100x the line bet. Q = 75x the line bet. J = 50x the line bet. 10 = 30x the line bet. 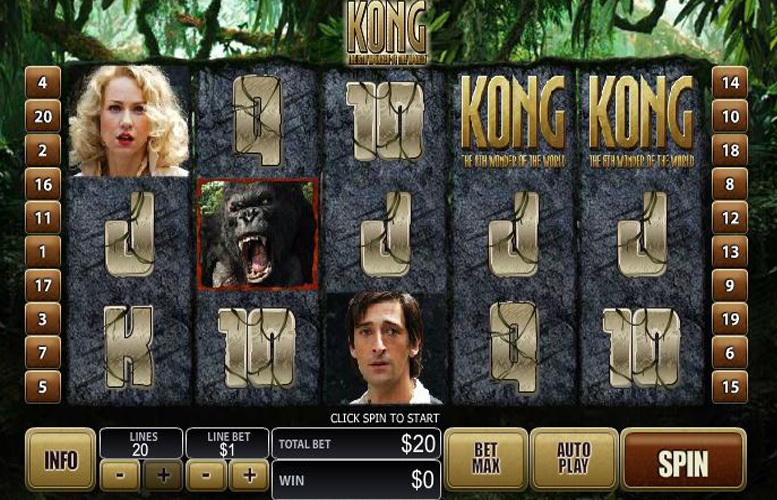 Players can vary their bet size with ease on the Kong slot. They’re awarded a great deal of control, with options to adjust the number of pay lines used, and the value bet per line. When everything is set to minimum, the lowest bet possible is 1p, and with all values maxed out, it’s a reasonable £40. All told, the Kong: The 8th Wonder of the World slot is a great game. With so many diverse features, it’s difficult to see all that the machine offers in just one visit. This makes for a game with high replay value. For fans of the movie, it’s a must, and for those who love a well-designed, high quality slot machine, it comes highly recommended. This game has a rating of 5 / 5 with 410 total reviews by the users.